We offer most items to be ordered individually (no minimums), simply customize them to your liking and add them to your cart to checkout! Looking for custom shirts, or items not available to order online, simply click here to view our catalog of items available for custom orders. Creating an order link is the perfect way to go if your organization wants to order as a group but you don't want to deal with the hassle of collecting money. Provide your own jacket, shirt, bag, or accessories! We’ll customize it for you and send it right back. 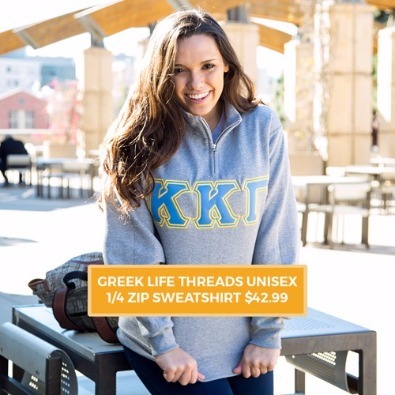 Add to your Greek Apparel collection and represent your Fraternity or Sorority in comfort and style. Direct embroidery items do not have Greek applique letters, all direct embroidered Greek letters are in Times New Roman font, in your choice of size from .75" to 2" tall. 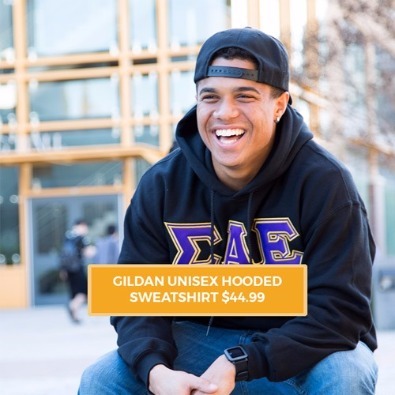 How to get your sweatshirts to Greek Life Threads? 2. Drop it off at the address above. What types of sweatshirts can be used? If you think we can fit letters on it, chances are we can use it! I prefer not to deal with shipping, and I am not located near Greek Life Threads, how can I get my sweatshirt to you? Select the "email me a shipping label option" when you place your order. We will email you a shipping label to send your sweatshirt in. The cost of shipping to Greek Life Threads will be added to your order. Once you pack your sweatshirt, just attach print the label and attach it to your package. You can then drop it off at any Fedex/Kinkos location and they will do the rest. Click here for drop off locations. Started by college students, for college students. Greek Life Threads strives to make your custom products with the highest standards. We use the highest quality clothing, fabrics, threads and ink. We are conveniently located in Southern California; within driving distance of Los Angeles, Riverside, Ventura, San Diego and Orange County. Browse our site and start your custom order today! Taking Greek Apparel to the next level! Here at Greek Life Threads we strive to provide quality letters and garments at a far more affordable price & convenience. Stay in the loop by joining our mailing list to hear about new products and promotions. You can also check us out on Instagram & Facebook for promotions, giveaways & special orders! Girl Scouts Partner up with Sigma Gamma Rho Sorority. Bundle up on your orders and save on shipping! All orders that exceed over $100 will receive free standard shipping to the lower 48 states. Save on shipping when you have an upcoming group order that way your entire chapter can receive their garments together.